Seems like there’s no end to the things I discover through life. One of the major problems I have is never enough time to do everything. This is not just a day-to-day thing but has a much broader context. As I get older I discover there’s so much I don’t know that I want to know! And the other major issue I have is a short attention span. Call it a character flaw but if I’m not fully engaged with something, or don’t have a solid deadline, I tend to put it aside for a rainy day. On the upside, I seem to have developed a flair over the years for reinventing myself. It seems like I find a comfortable place to be in the grand scheme of things and then start rearranging the furniture. This is very true of my musical career as well as my personal life – and I like it! I find it inspires me creatively and musically, I am never bored, and (I sincerely hope) never boring! So, I made the decision earlier this year to return to study. 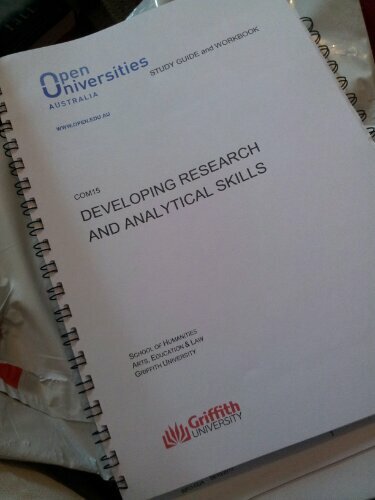 I’ve enrolled in a Bachelor of Communication at Griffith University, studying fully online via Open University Australia. This is going to be a bit hairy considering I have no Internet at home until January – all my recent blog posts have been done on my mobile phone (god bless the WordPress mobile app!) but I’ve got some contingencies in place to stay up to date. And today, my first unit arrived in the post. I’m feeling scared and excited all at once – a fabulous way to be! So, I’m off to a quiet spot in the garden to start my first week’s reading and discuss it with the bunnies.